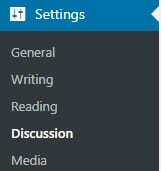 You disable comments on new posts you publish in the future in Settings > Discussion. 2. Uncheck the box next to ‘Allow people to post comments on new articles ‘ under Default article settings. 2. Select ‘Automatically close comments on articles older than” and choose the number of days before comments are closed. 2. Check the box next to ‘Allow people to post comments on new articles ‘ under Default article settings. Any changes to your default article settings on Settings > Discussion only apply to any posts or pages you publish in the future. Refer to enable and disable comments on published posts and pages here.